Online shopping is surging, experts say, and NYC buildings need to deal with the package pile-ups. MANHATTAN — New York City residents — who live in smaller spaces, use less energy and drive less since they can walk more or take public transit because of the city's density - can pat themselves on the back for having a smaller eco-footprint than other Americans, researchers say. But the city’s green perch is being taken down a notch by the rise of the new economy with companies such as Uber and Lyft adding cars to our streets and the uptick in deliveries — along with the packaging that comes with it — from shopping online for everything from clothes and furniture to meal prep kits. Researchers are just beginning to conduct studies to understand these impacts. “All of these new services can be a mixed blessing from an environmental perspective,” said Eric Goldstein of the National Resources Defense Council. “Definitive pronouncements will have to await more definitive studies. These are challenges that weren’t even around five years ago. It’s going to be necessary to address them." The issue is on Mayor Bill de Blasio's administrative radar. "Innovation and technology are changing the way business is done in New York City and that creates new opportunities for sustainable living, mobility, and energy," said Daniel Zarrilli, senior director for Climate Policy and Program at the NYC Mayor's Office. That's why the city, through its OneNYC sustainability program, is investing in renewable energy, electric vehicles, and its "Zero Waste" plan to stop sending garbage to landfills by 2030, he added. If car services are reducing private car ownership for millennials and are only used to make necessary trips, the impact may be minimal, Goldstein noted. “But if it pulls people off mass transit, it could be a bad thing,” he said. Environmental impacts will vary depending on a company’s operating policy, whether it’s e-hail, shared taxi or peer-to-peer ridesharing, among others explained, Joseph Chow, professor at NYU Tandon School of Engineering and deputy director at the C2SMART University Transportation Center at NYU. “For example, one service may reduce vehicle-miles-traveled if they transport multiple passengers, but a poorly operated service can also lead to many empty miles traveled in search of customers,” Chow wrote in an email. A recent study on app-based ride services like Uber and Lyft found they were making Manhattan’s gridlock worse in Manhattan and the western parts of Queens and Brooklyn. The report, from transportation analyst Bruce Schaller, found a net increase in 600 million vehicle miles traveled, translating into a 3 percent to 4 percent jump in traffic. Looking at the percent of traffic these companies make up, however, doesn’t necessarily equal increased congestion since these services might be counteracting other car or taxi trips, Chow said. Sharon Di, a professor of civil engineering at Columbia University where she’s also a member of the Center for Smart Cities at the Data Science Institute, raised questions about whether these services were spurring car trips when people would otherwise have taken the subway, the bus or walked. “The question is what mode of transportation did they use before? If this is induced demand, that could make the system worse,” she said. She is presently working on a mathematical model looking at how high-occupancy toll lanes can encourage ridesharing and prevent what’s known as the Braess paradox — which is that building new roads does not necessarily reduce traffic congestion. Uber disputed that its company is causing more congestion, citing a report funded by the city that determined congestion is primarily caused by construction and other economic activity. UberPOOL, which helps get more people into fewer cars by making ride shares easier and cheaper, now accounts for 25 percent of its rides, the company noted. “Uber is growing the fastest in areas outside of Manhattan where access to mass transit is limited,” an Uber spokeswoman added. There’s no denying that more New Yorkers are increasingly shopping, with many residential buildings grappling with the package buildup and renovating lobbies to accommodate the onslaught in deliveries. Professor Jean-Paul Rodrigue from Hofstra University confirms that online retail has been growing at a 15 percent annual rate, with each apartment unit generating about 1.5 parcel deliveries per week, Chow noted. In a dense urban setting like Manhattan, deliveries can actually be more effective, he noted. The city is seeing a rise in distribution centers within city limits, like one that’s coming to Red Hook and another possibly planned for Staten Island, but there are also centers popping up nearby in New Jersey, where, for instance, food delivery service Blue Apron recently announced it’s adding a second fulfillment center. “Ultimately, if [these trends] end up eroding New York City local restaurants or food providers for a regional hub approach, that too could have unfavorable long-term consequences,” Goldstein said. 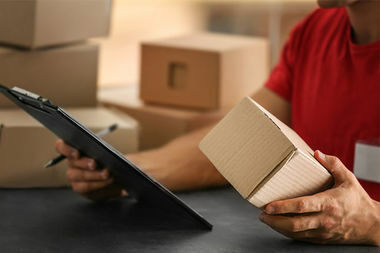 When it comes to deliveries, some companies have been responsive to customer complaints about excessive packaging, and advances in technology have resulted in the use of lighter-weight materials such as plastics and aluminum instead of glass and steel, reducing the amount of waste generated per person, according to the city’s OneNYC long-term environmental plan to reduce carbon emissions. Also, the rise of the digital and sharing economies are in some ways reducing waste — who needs CDs anymore? — the report noted.